You may use ceiling fans to help cool your house during the summer, but did you know you can use them in the winter to help boost your home heating system as well? 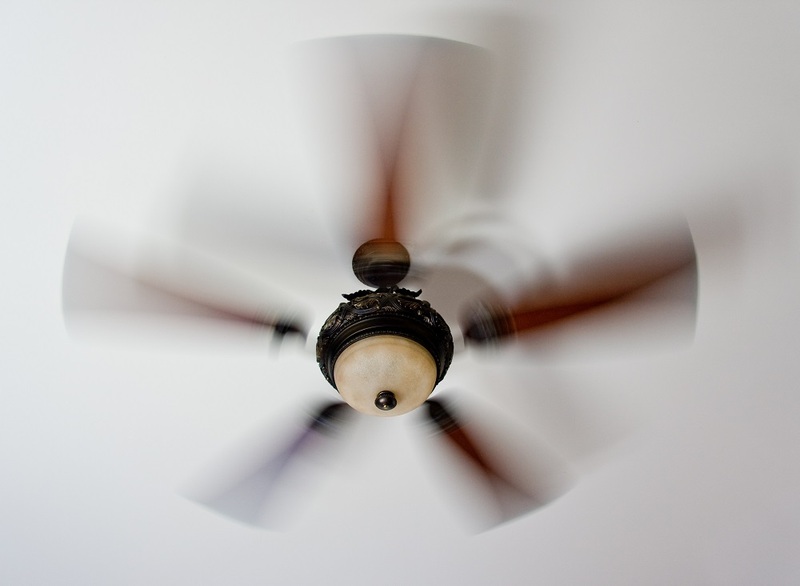 A ceiling fan normally cools the home by pushing air down directly under the fan. When the blades push air down, they create a wind-chill effect and can facilitate evaporation, further aiding in cooling. This does not actually lower the temperature of your home. It just makes you feel cooler. Because hot air rises, a lot of the energy your central heating system uses warms the top of the room, near the ceiling. Check to see if there is a switch on the fan motor casing. If there is, flip it and see if the air is pulling up or down. Reversing the direction of the fan’s rotation to pull cooler room air upward will push warm air near the ceiling downward. As we’ve discussed in other columns, your home most likely leaks air. Homes with high or leaky ceilings will be harder to heat. If you have air leaking into your attic, the negative pressure inside your home compensates by pulling in cold air near the floor. In the clockwise direction, ceiling fan blades draw the cold air in from around the room and push it upward, which then pushes the warm air hovering near the ceiling down into the room. Does this save me money? Ceiling fans, especially if they are Energy Star-rated, cost maybe a few cents per hour to run and may allow you to lower your thermostat a few degrees. This will cause your furnace to run less often which may lower your energy bills with no significant reduction in comfort. To ensure optimal savings and comfort, it’s important to choose an energy-efficient fan. Choose an Energy Star-rated ceiling fan, which are up to 40 percent more efficient than standard fans, and which use better motors and innovative blade designs to lower the fan’s energy consumption . Another fun benefit of running your ceiling fan in the winter is the potential for improved airflow and air quality. Your ceiling fan supplements the air circulation by your HVAC and will definitely help to circulate stale air which, during heating season, sits near the ceiling. It’s important to remember that ceiling fans make people warmer or cooler, not rooms. While they may only cost pennies per hour to run, you’ll want to turn your fan off when you leave the room. Because they only distribute air more evenly and don’t actually heat it, running a fan in an empty room is a waste of electricity. The room with the thermostat is the exception — leave the fan in there turned on so that the thermostat has an accurate reading of the room’s temperature and doesn’t use extra energy trying to heat the room further. If you have an open stairway in your home, installing a ceiling fan at the top of your stairs helps redistribute the heat that rises to the second floor back down to the first floor. Keep this fan running while anyone is in the rooms near the first-floor landing. If the thermostat is near it, run the stairway fan whenever the central heating is on, so the thermostat gets a more accurate reading and the heating system doesn’t work harder to heat the whole house.